After sending an update of my petition for a Sunshine Act to the Chief Executive Officer of NHS Forth Valley I received this reply. Whilst I was employed by NHS Forth Valley I raised concerns that HDL 62, the Scottish Government Circular sent to all Chief Executives in NHS Scotland, was not being followed. When I was an employee of NHS Forth Valley I was formally written to by Dr Rhona Morrison, Associate Medical Director. 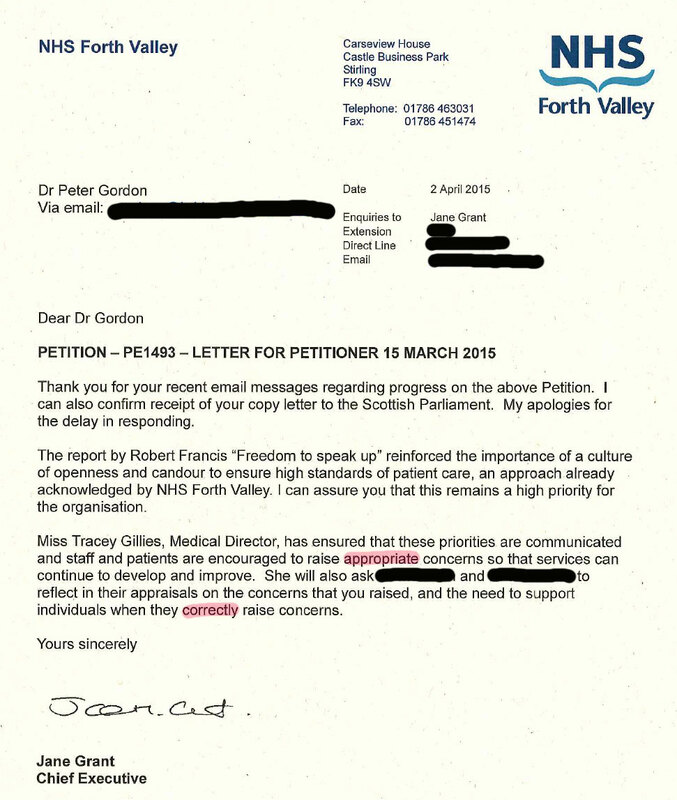 In this letter from the Associate Medical Director, which was both unsigned and undated, I was described as “unprofessional” and “offensive” for raising concerns that NHS Forth Valley was not following extant Scottish Government guidance on transparency regarding declarations of interest. This letter confirmed that I would be “invited” to an “informal” meeting by the Associate Medical Director’s immediate peers. My experience of this “informal” meeting was that my character, reputation and probity were robustly questioned by the Medical Director, Dr Peter Murdoch, and the General Manager, Mrs Kathy O’Neill. This meeting was not minuted. This meeting left me distressed. The Chief Executive Officer reinforces in her letter the “importance of a culture of openness and candour”. However, Jane Grant, the Chief Executive Officer for NHS Forth Valley then goes on to give qualifications: that any concerns raised should be “appropriate” and “correct”. in the NHS - a safer way to report mismanagement and bullying. all the submissions requested as part of evidence gathering.